The bladder is filled with 120-200 mL of saline to help delineate its contours. The peritoneum is opened from one umbilical ligament to the other and the incision is extended upward to include the urachus, which is divided near the umbilicus (Fig. 7). The anterior surface of the bladder is mobilized and the prevesical and preprostatic space entered. 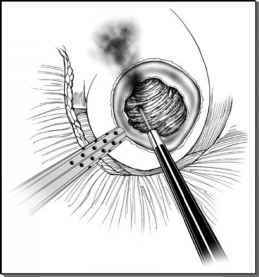 The endopelvic fascia exposed is opened, uncovering the levator ani fibers. The latter are bluntly pushed away from the prostate; the puboprostatic ligaments are divided, giving clear access to the dorsal venous complex, which is ligated with 2/0 Vicryl on an SH needle. Transection of the dorsal venous complex is left for the final apical dissection. Once completed, this step provides adequate space for accurate control of the lateral vascular pedicle.